Unlikely Influences is a series of weekly blog posts about how writers can learn the tricks of their trade in odd places. Most are from guest authors, but I’ll pop in from time to time too. This week’s installment is by Lise Fracalossi. “Hardenstein 2014 – Adventurers” by RalfHuels (photographer), Anja Arenz, Chris Kunz, Dossmo, Niamh, Paolo Tratzky, Svenja Schoenmackers / . Licensed under CC BY-SA 4.0 via Wikimedia Commons. First, a brief definition, for those of you who haven’t seen the movie Role Models. 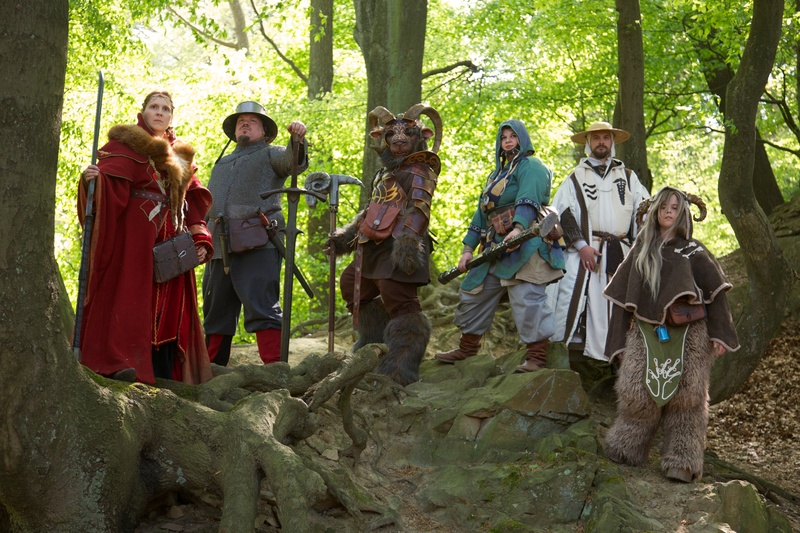 LARPing (or larping) stands for live action roleplaying, or, what happens if you play D&D while wearing costumes. I started out in the theater-style larp/interactive literature community, which involves short, one-shot games which feature people pointing index cards at each other. But I have recently graduated into playing live combat or “boffer” larps, which means I’m exactly as nerdy as that “Lightning Bolt” guy. I’ve been larping since 2005, and I have played over a hundred one-shot games. I’ve run a handful, and written two. I also crew two live-combat campaigns, and am about to start playing another. Here are some of the things I’ve learned about writing along the way. Every character is the hero of their own story. This is a common piece of characterization advice, but I didn’t truly understand it until I wrote a larp for the first time. In a LARP, every character must be the hero of their own story in a way that’s simply not true in fiction. Why? Because each LARP character has a player, who is usually paying in some form to be there. If they don’t have stuff to do and the means with which to do it, they’re going to be bored, and they’re going to feel like they didn’t get their money’s worth. Imagine if all the second bananas from your average fantasy novel rose up and demanded angrily that they have more to do, and you’ll about picture what this is like. 2. What makes a satisfying plot? Plot is conflict. Plot is risk. Plot is a question mark. Have you heard all these before? They’re true in larp, like in writing. Pregnancy is not a plot, but “how do I find out if I’m carrying the heir to Russia?” is. Being in love is not a plot, but “I want to marry a woman whose family wants to kill me” might be. “Don’t get caught” is not a plot — in a dramatic way, because it’s really saying, “avoid conflict,” isn’t it? But “frame someone else for the crime you committed” sure is. When I’m writing larps, I often ask myself, “to carry out this plot, what will a character actually do in game?” In this way I can see if they’re going to spend four hours engaged in some activity — playing a wargame, dancing, collecting widgets, questioning suspects, etc — or four hours spinning their wheels. I use a similar rule when writing outlines. It’s easy to fall into a trap where your outline says “Romeo and Juliet fall in love.” But that’s not a scene you can write. So I give myself the rule: scenes need to be discrete, and something needs to change in each one. Instead of “they fall in love,” your outline lays out scenes where they meet at a party, have heartfelt conversations on balconies, pretend to be dead to smuggle themselves out of the city, etc. (I think there might be zombies in here somewhere? It’s been a while since I’ve actually read R+J). Then, when it comes time to write those scenes, you aren’t left scratching your head and cursing past-you. 3. Pacing; or, how do I keep this book from ending in the first five pages? This reveals two ways for a game to end. It can end because the characters can’t meet a goal (i.e. defuse a bomb in time, keep Azathoth from being summoned, etc), or it can sputter to an end because the players have met all their goals. The latter is often how games end naturally (i.e. the directors/writers see how things are going and call endgame), but when this happens at the one-hour mark in a four-hour game, something has gone terribly wrong. This is analogous to pacing in writing fiction. Like in a larp, you are chasing a flow state, an intermediary between “boring” and “frustrating.” Since the reader’s state is an echo of a character’s, the obstacles you put in your character’s way have to tread a narrow path between too difficult and too easy. Your untrained farmboy can’t — and shouldn’t — take on the evil wizard-king on page one. Likewise, if your character’s goal is to summon Azathoth and destroy the world, you prooooobably need to make sure they don’t do it until the final hour of game, or the rest of your players are going to be pretty upset. So you put goal-posts and gates along the way. In the case of the farmboy, maybe he needs to find a mentor, learn the ancient magic of chicken summoning, and gather an army of poultrymancers before he’s ready for the final conflict. In your Azathoth-summoning larp, maybe your villainous character needs to collect some magical items and find some allies, and maybe they can’t begin their summoning until “the stars are right” (i.e. at some determined time). In fiction pacing, our biggest tool is story structure, a scaffolding which can tell us where to place these gates and goal-posts. When structures work, the reader will feel the right way at all the right times; the story will feel familiar, in a deep and important way. In conclusion: It’s unsurprising that characterization, plot, and pacing form the basis of a satisfying larp; it’s a story, after all, and similarities persist through different media. LARPing has just given me an opportunity to turn story upside down and look at it from a new angle. Lise Fracalossi is a front-end web developer and fantasy writer living in Central Massachusetts. She studied cognitive science at Vassar College, and is a graduate of the Viable Paradise SFF writing workshop. You can read more of her ramblings on larp, writing, or both at her blog or on Twitter.